Stay up to date on changes in Google's algorithms and other search engine news. This newsletter will not only tell you what is new, but will also give you step by step easy to follow instructions on ways to take advantage of these changes and improve your website. Note: This course is temporarily closed. 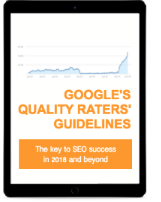 Step by step instructions on how to improve your website's ranking in search engines in ways that fully comply with Google's Quality Guidelines. This course is good for both complete beginners and intermediate SEO's. Not sure which links to disavow? 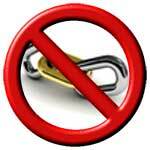 This tool allows you to check a big list of links against Dr. Marie Haynes' disavow blacklist. Results are shown both on the screen and in a downloadable CSV. This is a great tool for those who regularly audit sites. It's not a full link audit, but it can help save hours of time. 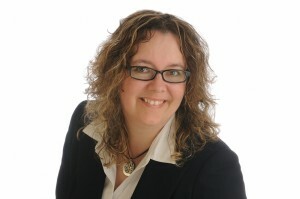 Marie Haynes has pored through the Google's Quality Raters' Guidelines word-by-word, developed optimization strategies, and is seeing amazing results with her clients in implementing these strategies. In this book, she shares the tips and how-to's that will help you improve your site's quality in the eyes of Google. $89 Temporarily reduced to $39. 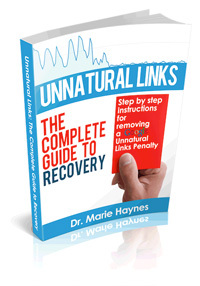 This book was published by Dr. Marie Haynes in early 2013 and has been used by hundreds of site owners to help them remove a manual unnatural links penalty administered by Google. The book gives step by step instructions on how to get this type of penalty removed. Have Marie and the MHC team do a site quality review to help your business get even more traffic from organic search. Have an issue with your newsletter subscription? Hi! And thanks for being a part of my training programs. My name is Dr. Marie Haynes and I'm obsessed with understanding and teaching about Google's algorithms. I speak regularly at conferences such as Pubcon and SMX on topics including Google Penalties and Google algorithm changes such as Penguin. I have helped hundreds of businesses recover their lost Google presence. Here is more information on me as well as some of my success stories and testimonials. Want to have me audit your links? Contact me for a quote. All content ©2018 by Marie Haynes Consulting Inc. and may not be reproduced in any way without written permission.